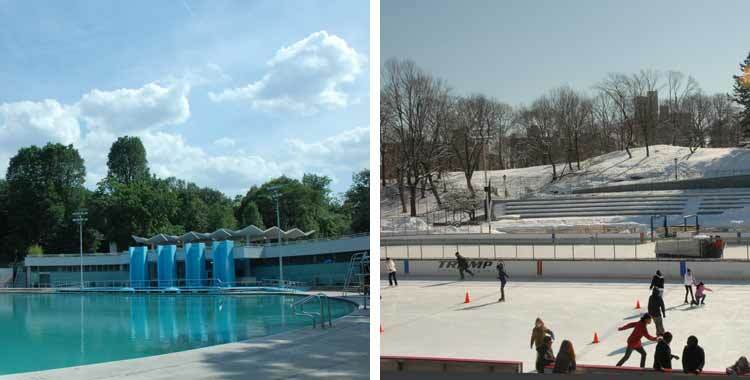 Lasker Rink and Pool opened in 1966 between the Loch and the Harlem Meer. While Wollman Rink (in the lower Park between East 62nd and 63rd Streets) converts its ice rink into a venue for summertime activities, Lasker Rink is transformed into a public swimming pool. In its ice skating mode, Lasker has two oval rinks: one for high school hockey teams and one for all ages. The swimming pool is a popular neighborhood retreat from New York summers. Lasker Pool is operated by NYC Parks in the summer. For information, please visit their website. Please note that certain rules apply. For example, you must bring a lock and only a towel, shoes, a book and water bottle are allowed by the pool; bags are not permitted. Visit NYC Parks for details. Lasker Rink is operated by the Trump Organization in the winter. For information, please visit their website. Mid-Park between 106th and 108th Streets.